Christopher P. Stadelman, 48, of Thomas and South Charleston, died Friday, May 11, 2018 at home, after a four-year battle with colon cancer. He was born Dec. 12, 1969, in Summit, N.J., the son of Nancy Miller (Tom) and the late Paul M. Stadelman (Helen Oates). He is survived by his incredible wife and partner in life of 18 years, Kelly J. (Cripe) Stadelman; three brothers: Paul Matthew (Lisa) Stadelman of Beckley, Jonathan Scott (Alyssa) Stadelman of Pittsburgh, Philip Marsh Stadelman of Buckhannon; one sister, Rachel Marie Stadelman Joyner (Michael) of Coolville, Ohio; three aunts, and several nephews and nieces, numerous cousins and countless wonderful, supportive friends of #TeamStadelman. Chris was a graduate of Marshall University with a bachelor’s degree in journalism and minor in political science. He was blessed to have three dream jobs over his career: 10 years at the Charleston Daily Mail in a variety of capacities, seven years as co-owner/operator of The Parsons Advocate with his wife, Kelly, and three years in the office of Governor Earl Ray Tomblin, where he served as communications director and chief of staff. He and Kelly also operated a public affairs and research company together. Chris is a member of the Marshall University Journalism Hall of Fame. 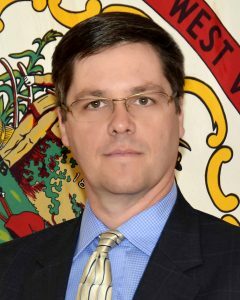 He was named a Distinguished West Virginian by Gov. Tomblin and an Honorary Mountaineer Brigadier by Major General James Hoyer. A former board member and still active with the West Virginia Press Association, Chris was a key contributor to this year’s WVPA Newspaper Ownership Initiative with West Virginia University and the West Virginia Press Insight video program. ​A​ Celebration of Chris’ life will be Monday, May 21 at Christ Church United Methodist in Charleston. Friends may visit with the family from 1 to 3 p.m. with a service beginning at 3 p.m. with the Rev. Jay Parkins officiating. A Celebration of Chris’ life will also be held at Mountain State Brewing Company in Thomas at 6 p.m. Thursday, May 24. In lieu of flowers, please consider a donation to the Stadelman Journalism Scholarship, established through the Tucker Community Foundation, P.O. Box 491, Parsons, WV 26287.